I first heard about Cotopaxi in 2016 and have been wistfully eyeing their products since. 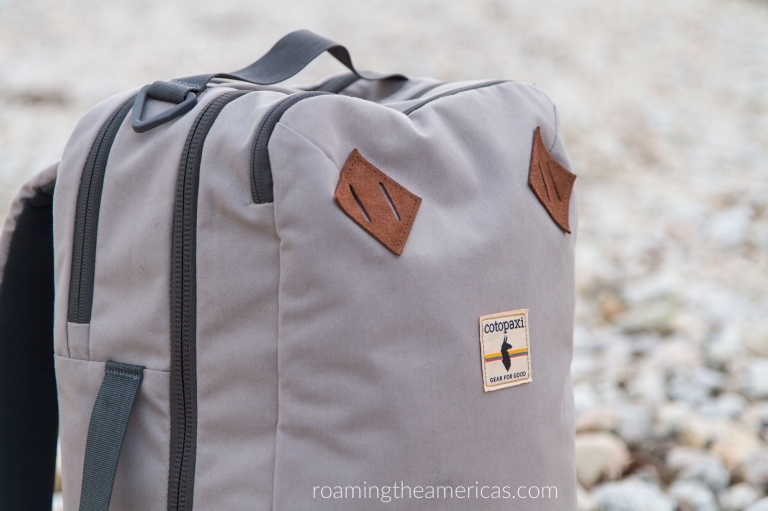 Cotopaxi goes beyond making great travel and adventure gear with their Gear for Good philosophy, which makes me happy to spend my money with them. In addition to funding sustainable poverty alleviation with a portion of their profits, Cotopaxi also ensures fairness, sustainability, and quality in every step of the manufacturing process. When they came out with the Nazca 24L Travel Pack, I thought it looked like a perfect fit to replace my 10-year-old carry-on luggage (ahem, the one that’s covered in cat scratches, dog hair, and falls over when I stand it up on its wheel end). The Nazca 24L promptly went on my Christmas wish list (thanks, Mom! ), and I’ve had 2 mini adventures in January to give it a test run. Here’s a breakdown of the Nazca 24L features, what I packed, and a quick review. For reference in terms of clothing size and how the pack fits my body, I’m a 5’3″ female with a small frame. ⓘ Check out all of Cotopaxi’s sale items (up to 50% off) here. Want a bigger version? Check out the new Allpa 28L or Allpa 35L! For my first trip, I was traveling from Pennsylvania to Florida in the winter. Temperatures were cold at home (10 – 30 degrees F) and comfortably warm at my destination (65 – 80 degrees F). I traveled for 5 days and 4 nights to visit family, so I also took some camera gear. What I wore on the plane: Jeans and a t-shirt, zip-up hoodie sweatshirt, fleece jacket, and sneakers. What I carried in my purse: Wallet, 2 books, a journal, zipper bag with colored pencils (for my color-coded book highlighting–don’t judge), phone charger and headphones, sunglasses, small makeup bag, and a small toiletry bag. What I packed in my camera bag: Canon 7D with 17-55mm f/2.8 IS lens, Canon 430 EX III-RT flash, LP-E6 camera battery charger. My husband carried this as his carry-on “personal item” since I already had the Nazca 24L and my purse. Laptop and cord–My laptop is 15″ and isn’t very thin, so it was snug but fit fine. I had to pack the cord in the front pocket, though, as I didn’t have any space inside the pack. Here’s a video walk through of how I packed for a 5-day trip in the Cotopaxi Nazca 24L! Packing for 4-5 days was a tight fit, but I wanted to be intentional about packing light on this trip. I really thought about each piece of clothing that I took, and I had just the right amount of clothes (just 2 things I didn’t wear). My second trip was to New York City in January for 3 days and 2 nights. While I had to pack bulkier clothes for winter weather, the fit was not as tight for that trip since I just needed a couple of changes of clothes. Solid, sturdy design–Of course, time will be the test in terms of quality, but the build and quality feel excellent. Plus, Cotopaxi guarantees their products for 61 years, and they offer a replacement, repair, or exchange if anything goes wrong with the product. Theft-prevention zippers–To be honest, I don’t know if that’s the official term for this zipper design, but that’s what I’m calling them. The laptop sleeve and main zipper have a loop that the zipper has to pass through, which helps prevent easy access. They aren’t that challenging to get open yourself (I went through airport security twice and had to remove my laptop), but they offer a bit of extra security. Padded laptop sleeve–The padding isn’t very thick, but it feels like enough. Comfortable size and fit–As I mentioned, I’m petite and have a thin frame. This backpack was perfectly comfortable for me, and the waist strap was very helpful since the pack was heavy with my laptop in it. It covers my back without feeling bulky. For reference, the mannequin in the video above looks like a male with a medium build. Cotopaxi’s “Gear for Good” philosophy–Can I just say again how much I love this? Organized zipper compartments inside–These make my type A heart swoon. This was the first time I had used any kind of luggage with compartments (as well as my first time using packing cubes), and it was amazing. I was able to access everything efficiently and stay organized throughout my trip. The color that I ordered–I love the driftwood color, but it’s already attracting dog hair from my black lab. Oops. I wasn’t really thinking about the material when I picked the color since typical luggage is a canvas material that dog hair doesn’t stick to. Something to keep in mind if you have pets. Depending on weather, clothing size, and packing style, the Nazca 24L can be easily used for overnight or weekend trips, and up to 4 or 5 days if you’re a light packer in warm weather. Overall, I highly recommend the Nazca 24L Travel Pack for anyone looking for a compact travel backpack with an organized design that fits carry-on restrictions. Check out the latest prices and more details here. Del Día Dopp Kit // I just picked one of these up recently, and I love how nicely it keeps all my toiletries snugly organized. I haven’t used it with the Nazca yet, but in the Allpa 35L it fits perfectly in the front pocket. Agua Bottle // A reusable water bottle is SO handy for traveling (plus, think of all the plastic you’ll be saving). While I don’t have a Cotopaxi one yet, I am in love with all the colors they have and plan to add one to my gear soon! This post isn’t sponsored in any way. I just dig what Cotopaxi is all about as well as their products, and I wanted to share this one with you. Technically, I did receive the product for free because it was a Christmas gift from my mom. 🙂 But it’s definitely a product I’d invest my own money in as well.